Cadbury Dairy Milk has two new versions of the ‘Shubh Aarambh series’ television commercials on-air which led me to exploring their digital touch-points. And guess what? I could only find a Facebook Brand page. One would think Cadbury and Facebook are a match made in social media marketing heaven, but the Facebook brand page for CDM is, at best, meh. For starters, considering the history of Cadbury in the country, the timeline could have been leveraged. That’s basic you would think. All we get are some sporadic posts with the new commercial videos which we get to see on TV anyways. 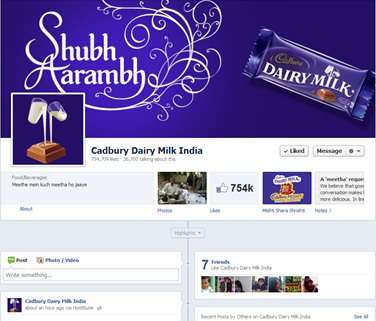 The fact that intrigues me about Cadbury is that, as a brand, digital seems like a perfect fit. But someone out there obviously doesn't share the same opinion. The Facebook integrations seem like a check-in-the-box. The campaign lends itself to great digital activations on social and otherwise, unfortunately no one at Cadbury seems to notice. The Cadbury Perk and Dairy Milk Silk pages share the same fate. They just exist.